That’s the start of many a joke. But you’ll have to tell me how funny you find this after reading it. This is a true story from a close friend of mine who is fighting cancer. My friend is doing well — he’s certainly in good spirits, and the scans he shared with me show great progress in treating the cancer. OK, so even though I feel fine my Red Blood Cells and White Blood Cells and other things are completely out of whack. One more transfusion (three units this time). Hopefully I’ll be good for this coming Thursday. Arriving at Dr. M–’s office on Thursday I went to the receptionist’s desk and signed in as per usual. Receptionist – Last name, please. Receptionist – Oh, you’re here for an infusion. Just go right in to the center. Me – No, I have to have blood drawn and see Dr. M– first. Receptionist – I don’t see you on his schedule. You’re just here for an infusion. Go right into the infusion center. Through that door there. Me – No, I have a card that says I have an appointment with Dr. M–. I have to have blood work done before the infusion and I have to see the doctor. Receptionist – Well you’re not on the schedule. Go on into the infusion center and they’ll draw your blood and take your vitals, and I’ll check with Dr. M– about seeing you. Me – OK, but no one is supposed to stick a needle in me except George. Me – George told me that no one should put a needle in me except him. I am telling you what he told me. Maybe you should check with him. Receptionist – OK, just go into the infusion center and I’ll check with George. Me – OK, thank you. R– and I go into the infusion center and see the head nurse. Me – I’m here for an infusion but I’m supposed to have blood drawn and then see Dr. M– before that. Nurse – Uh, OK. Have a seat and we’ll take your vitals and draw some blood and then we’ll see if Dr. M– is available to see you in here. Me – OK. George told me that no one is supposed to stick a needle in me except him. Me – George told me that he is the only person who’s allowed to stick me with a needle. I’m telling you what he told me. Maybe you can check with him. Nurse – OK, well take a seat and we’ll get your vitals. We sit. Nurse comes over with a tray to draw blood. Nurse – It’s OK, I can do it. The nurse looks at my arms, chooses a vein in the left one, swabs me down and inserts the needle. Nurse – There, that looks good. Oh, the vein collapsed. Me – George said he’s the only one who’s supposed to do this to me. Nurse – OK, I’ll be right back. She removes the needle, puts on some cotton and tapes it in place. She leaves. Nurse – [name], go down the hall and see George. We get up and troupe down the hall, nurse in tow (I don’t know why) where George is waiting. He sees the bandage on my arm. George – What are you doing? No one is supposed to stick you except me. Me – I told them three times. George – Never let them poke you. Just come and see me. Me – I told them. George – If they tell you something else just get up and come down here and yell my name. Me – They also said I had no appointment. George – well you do now. Nurse – he was only scheduled for an infusion. George – He can’t be infused without seeing Dr. M– and doing his blood work. That’s crazy. George – You can go now. I don’t need an audience. Nurse – But, . . .
George – You can go. You don’t need to be poking him anymore. George – Don’t ever let them do this to you again. Me – OK . . .
George picks his vein, inserts the needle, gets a good location and draws the blood. No muss, no fuss. The rest of the appointment went as usual. Dr. M– came in. We talked about Scotland, and movies and then he told me my blood work was in sad shape, and I wasn’t infused (as previously stated). If I had let them do what they wanted to do I might be in very bad place right now. Apparently George owns me now. 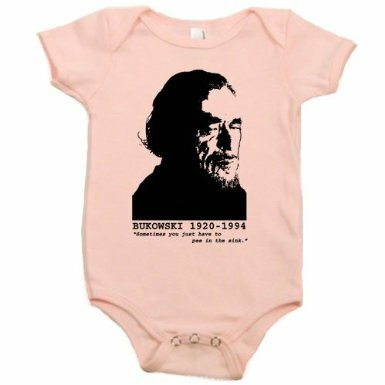 What would better suit your little cutie than this adorable Charles Bukowski onesie? Available in 6 colors, including “Asphalt,” and just right for that upcoming baby shower, this snap-shut one-piece for your little bundle includes a lovingly rendered image of the great man, as well this memorable quote: “Sometimes you just have to pee in the sink.” All yours, for just 21 Buks. 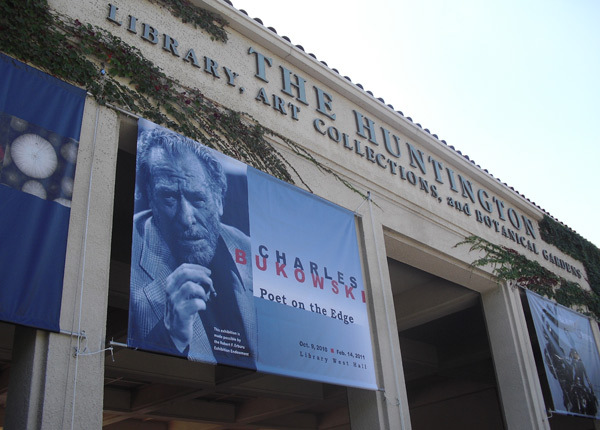 Here’s something some of us never thought we’d see: a major exhibition of Charles Bukowski’s work at a major, respected institution here in the U.S. I wonder if the Times’ Carolyn Kellogg is trying to make something of the Bukowski exhibit’s proximity to a rare edition of Chaucer, as if to say, “Here is the work of a bum beside the work of an acclaimed artist.” I don’t think that’s her point — she seems too smart for that — and I certainly hope it isn’t. If anything, Bukowski owes a clear debt to Chaucer, as do Mark Twain and Hemingway and Carver and indeed every other writer in English who wrote in the vernacular. Chaucer invented that style. No Chaucer, probably no Bukowski. 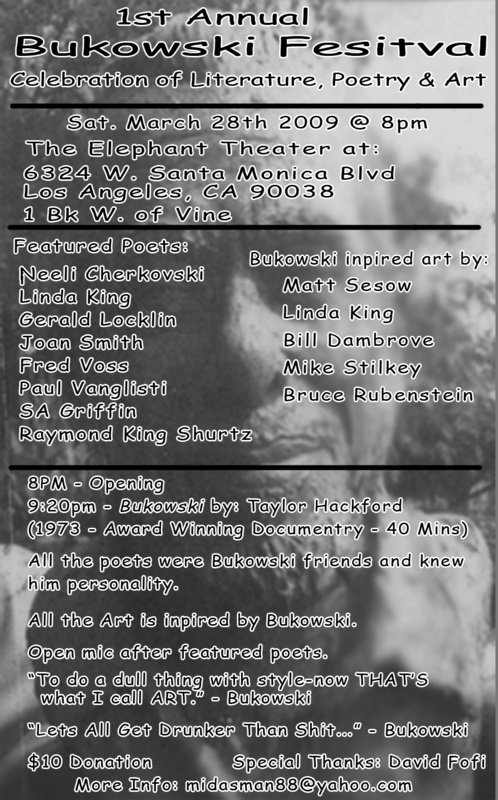 I’m always glad to see it when academia and the forces of order working from their fortresses of solitude pry open their doors and let in someone new or underground, so it’s a delight to see Bukowski honored in this way. I’m not sure how he would have felt about it (half-embarrassed and half-exalted, probably), but I intend to ask our mutual friend Gerald Locklin. And I intend to go see the exhibit. Y’know those celebrity tours where you can see Fred Astaire’s house, or visit W.C. Fields’ gravesite, or whatever? 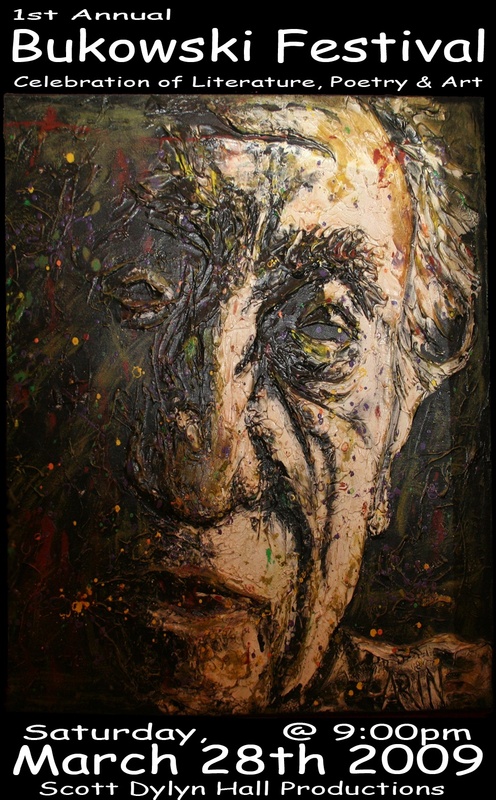 Now you can go throw up where Charles Bukowski did. And visit the post office where he was infamously employed. And so forth. And all for the “didn’t know there’s a recession going on” price of 58 bucks — which is about 53 bucks more than Buk ever had until the end. 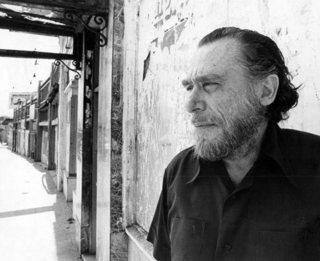 You are currently browsing the archives for the Bukowski, Charles category.